Another Garden Make-OverA Cottage Garden? 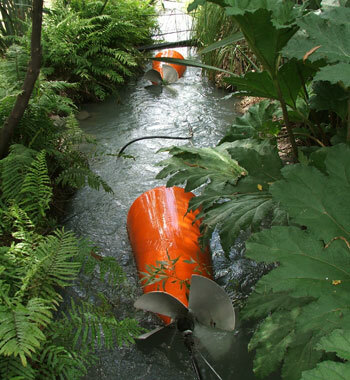 The Mark One stream was fed from a waterwheel, whose water delivery flow was large enough to naturally reach the pond at the bottom of the slope. I'm sure the intervening trees and shrubs loved the constant trickle irrigation. The water wheel was fairly temperamental, finally refusing to rotate. And no rotation meant no water. Non-Gardening Partner knew about sling pumps (also called river pumps) which simply use the flow of an existing water source (in my case the water race, or irrigation canal) to pump water. He found a manufacturer in Pennsylvania, USA, and ordered two to be shipped to New Zealand. Great excitement! Two large bright orange things duly arrived in the back of the trailer, and were quickly assembled. Just like magic their propellers turned, and water appeared from the hose. I dithered and dithered about what to do with this magic running water, and pretty soon common sense (or something) kicked in. I love discovering flowing water in a forest situation, so I decided to re-invent the old wriggling stream through the Wattle Woods, which had been dry for some years. And so the Wattle Woods Wriggling Stream Mark Two was created. This time the water flow was reliable, but it all disappeared into the garden halfway down the slope. I would have loved to keep things totally natural, but thick polythene solved the problem. I bought some and used it to line the stream course. I decided to camouflage it with river stones. 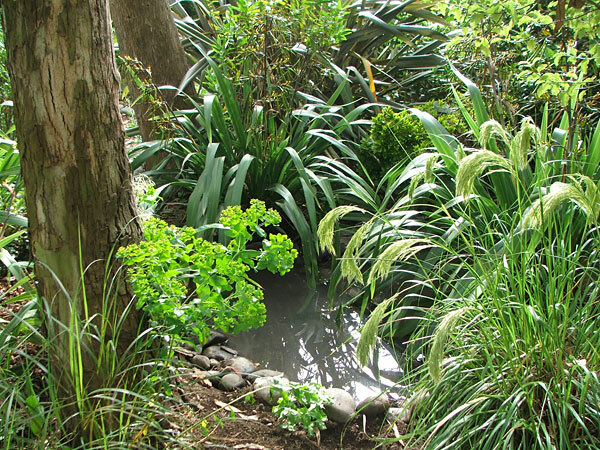 When gardeners try deliberately to place river stones in a person-made stream they always look artificial. I made sure I had different sizes, and even tried throwing them in randomly - I'm not sure that it helped! But importantly my stream and pond are now fully functioning, and time (plus plant growth) will soften the look of the intrusive stones. I have plans for a couple of small wooden bridges as part of the network of paths. The little pond at the bottom of the slope is also lined with polythene. It's the shape of a large jelly-bean, and wraps itself nicely around existing green Phormiums. 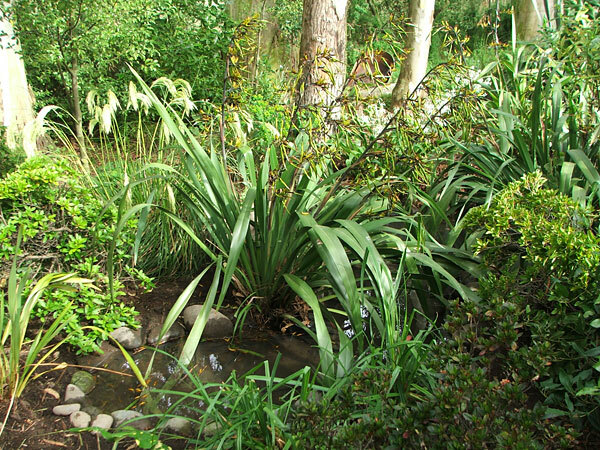 A ring of stones holds the liner around the edge, and the water overflows gently, keeping the spotted Ligularia and Wasabi damp. 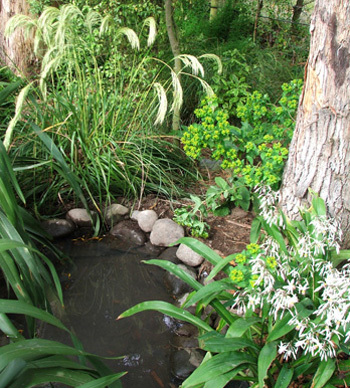 All plantings around the little pond are green and foliage-friendly. It's very exciting having a stream that keeps on flowing and a pond that's always full of water. Simple things pleasing a simple mind, maybe? Or a hard-working gardener enjoying the most deep and meaningful thoughts, while watching the water trickle by. Another Autumn Garden Make-Over	Top A Cottage Garden?